"How To Use Your Reputation To Dominate Your Market," by Andrew Wroblewski, is a comprehensive how-to guide on managing your reputation as a business. With the advent of many new types of marketing (search-engine optimization, pay-per-click, etc), many businesses have neglected their reputation. "How To Use Your Reputation To Dominate Your Market" aims to have the business re-take their reputation and turn it into a valuable asset through three easy steps to help with reputation management. Wroblewski asserts that by taking control of the business' reputation, the business can drive in more quality customers than with other methods of marketing. The three steps toward taking control of your reputation, monitoring, management, and marketing, are laid out in a way that is easy to understand and implement. Andrew Wroblewski also explains how to deal with a bad reputation and provides examples (in the oil and burger industry) of how other companies dealt with the problem. "How to Use Your Reputation to Dominate Your Market" is comprehensive yet succinct, which makes it easy to remember all of its points. 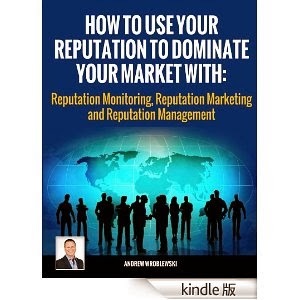 This book is a great choice for any business looking to draw more customers and improve their image through reputation management.